The re-development of our Marty Busch Reserve is now well underway, with completion to be in time for the beginning of the 2017 season. 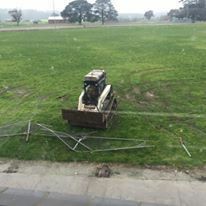 With a new surface, state of the art lighting, and new coaching box facilities, this will be a huge advantage to not only our football and netball club, but also to the wider community of Sebastopol. We will keep you updated with the progress during preseason, and look forward to welcoming current and new players in 2017. Go Burra!